There are two situations that make it it painful to go back to an older game: when it's something you only liked because you were a kid and didn't know any better, and when you play a highly praised game. The first is all about rose-tinted glasses: I know I've had my heart broken by games that defined me as a kid. I've kind of resolved to not dig too far into the things I played when I was younger, even though there's the possibility that it'll still hold up. Partially, I think: why hold on to the nostalgia? And partially it's the exact opposite, the need to keep my memories frozen in amber; perfect. Like how you might maintain your first love as this weird standard even though, looking back, the relationship might've been severely undeveloped and flawed in important ways. In this case, it's more like having the illusion of dungeons that felt like a healthy challenge when you were eight shatter when you're in your 20s and are better equipped to recognize design flaws over cherishing magical moments. The second painful situation has more to do with having expectations set by reviews and hype all before you touch the game. It's not "revisiting" as in, "a game you played before," but you're not exactly going in fresh, either. This weekend, I sat down and blasted through most of Castle Crashers with a few other friends. I'd never played it before, although it's probably not a stretch to say that the side-scrolling beat 'em up is largely considered one of those "must play" games on XBLA. I could sit here and write an essay about all the flaws that I saw. I'll summarize by with two points: 1) the game's tendency to devolve into mindless button mashing despite a built-in combo system, and 2) that overall it felt juvenile and uninspired. The specifics here aren't important; I'm sure you've had a situation where you've sat down with a hyped game and didn't get what everyone else saw in it. So what exactly happened with Castle Crashers, then? EDIT: I phrase it this way because I'm not sure it would get the same praise now than it did when it was initially released—also, people who played it with me had experienced it before. They didn't feel so enamored with it as they did when they initially played. Repeatedly, the thing that everyone mentions is the 4 player co-op. At the time—and to some degree, to this day—that's a big feature. People buy games they might otherwise never buy simply because it offers them an easy way to play with friends or loved ones. I can't name how many times I've found myself in a similar situation—it didn't even matter whether I enjoyed the game itself. Sometimes, the game felt fun not because of its design, but simply because I was experiencing it with a friend. 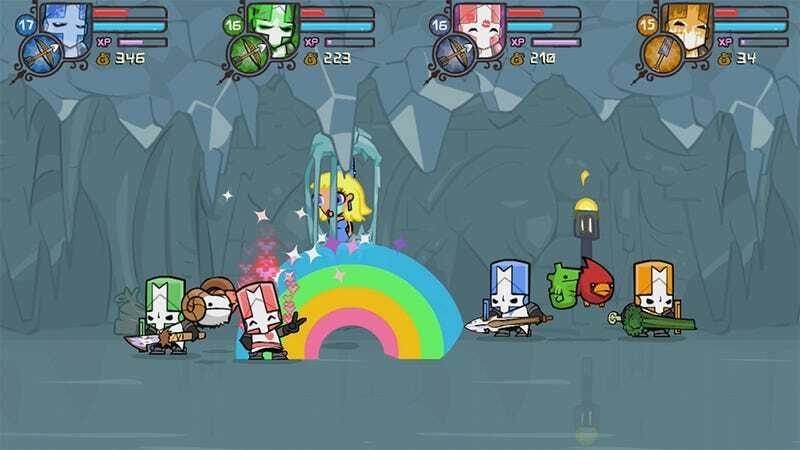 Now that that feature is common, it's illuminating to look back on Castle Crashers and think about what still holds up and what doesn't. It's not like that type of situation is so unique, either—where the mere existence of a feature completely frames how you look at a game, I mean. I think back on the MMO shooter MAG here. Honestly, I can't remember anything about how fun it was to play or how good it was. What I distinctly remember is the sense of excitement at the idea that players could form their own squads, platoons and companies. That players could have a large-scale war against each other, that individual battles meant something for the larger faction. It's wild to think about. All those features—all those promises, in a way—are things that have situated MAG as a superbly important game for me. I mean, heck, those are the types of features that upcoming big-name shooters hope to get right; MAG, in theory, was ahead of its time. How "right" it got it doesn't matter so much as the fact that it tried. That's what I remember. Still, I recognize that video game gems that hold up over time are rare. Revisiting an old favorite can be revealing, or it might be heartbreaking. There's only one way to find out. The question is, do you brave breaking those rose-tinted glasses?